SAN FRANCISCO, Dec. 5, 2018 /PRNewswire/ — MasterClass, the online education company that enables anyone to learn from the best in the world, announced today that acclaimed adventure photographer, professional climber, and Free Solo co-director, Jimmy Chin, will offer his first online class exclusively through its platform. In his class, Chin will teach the essential photography skills he used to capture breathtaking images from the harrowing peaks of Tibet to the unforgiving Antarctic tundra. Chin’s class is now available at www.masterclass.com/jch. Enrollment for the class is $90 for lifetime access, or $180 per year for the All-Access Pass, which grants unlimited access to all new and existing classes. 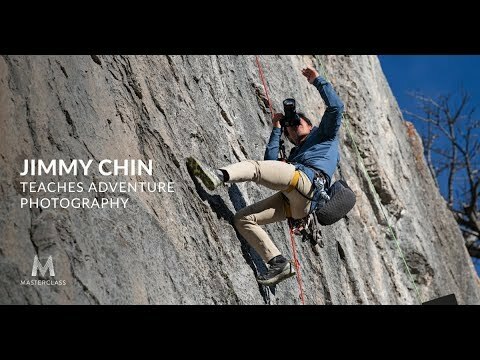 As one of the world’s most prolific adventure photographers, Jimmy Chin demonstrates an unparalleled mastery of both extreme exploration and visual storytelling. His success is defined by his ability to fold this natural passion into his art, with photos from his harrowing expeditions worldwide appearing on the cover of National Geographic and The New York Times Magazine, and featured in Adventure, Outside, Men’s Journal, ESPN Magazine, as well as The North Face and Patagonia catalogues. Chin’s work has earned him awards from Photo District News (PDN), Communication Arts, and the American Society of Magazine Editors. In 2015, Chin took his career to the next level by producing his first feature-length documentary, Meru, which won the coveted Audience Award at the Sundance Film Festival and was on the 2016 Oscar shortlist for Best Documentary. He built on that momentum with his second film, Free Solo, which critics hailed as one of 2018’s best documentaries. In his MasterClass, Chin takes a holistic approach to teaching his style of photography, walking students through the full creative process from finding inspiration to post-production. Employing the help of his friend and mentor, Conrad Anker, Chin takes students on location for a photoshoot in the Grand Tetons in Wyoming. He also shares exclusive behind-the-scenes footage and strategies from past shoots to remote locations across the globe, demonstrating the real-world challenges and solutions associated with capturing unforgettable shots in nature. The class is designed for photographers at every level, blending lessons in creative decision-making and leadership with more technical processes such as selecting photos and post-processing. Chin’s students will walk away with a deeper understanding of shooting outdoors, ultimately taking their photos to new heights – both literally and figuratively. MasterClass continues to expand its catalogue into new categories, bringing leading instructors to its engaged base of subscribers. MasterClass provides educational, inspiring, and engaging classes taught by the world’s greatest minds. With more than 45 classes that dive into processes, techniques and philosophies, MasterClass helps students progress more rapidly towards their own mastery, explore a new passion, or learn a new skill. It offers a unique learning experience, including video lessons, interactive exercises, course materials, peer interaction, and more. All classes are available as part of an annual subscription for $180, or for individual purchase at $90 for lifetime access to the class, and can be accessed online at www.masterclass.com or on the MasterClass mobile app for iOS and Android.